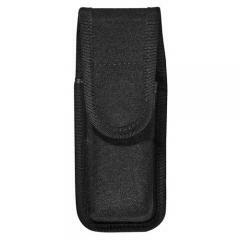 The Model 8003 Single Magazine Pouch from Bianchi's PatrolTek line of belt-mounted accessories is a convenient and secure way to carry a single pistol magazine, ensuring that you always have a reload within easy reach. Its contour-molded shape provides a secure fit and holds its shape well while empty. It rides on the belt in an easily accessible vertical position using a dual web belt loop that fits a 2 inch or 2.25 inch wide duty belt. The top flap provides additional protection and keeps the magazine securely inside the pouch, and fastens using a hidden snap closure.